Are these now-cancelled London Pride posters really homophobic “trash”? Irony has long been one of London’s most prodigious exports, but is it in short supply among its more literal-minded millennials? Are they suffering an irony deficiency? 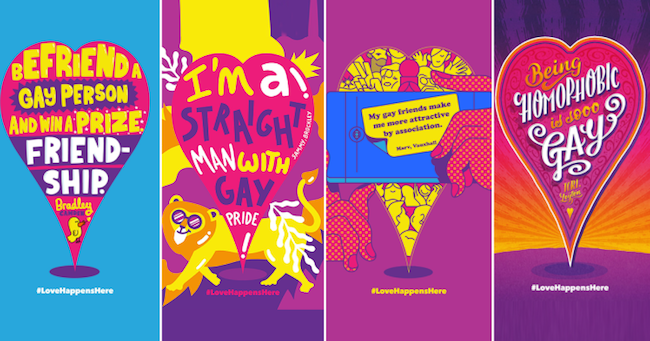 The images, innocently enough, were built around statements heard from Londoners on Pride, which an artist then interpreted into images for the online posters. People are also upset the posters make no mention of bisexuals or the transgender community. “It is clear we misjudged the content of some of the messages in this poster series, undermining the individuality, importance, and dignity of the LGBT+ community. We are genuinely sorry to have played any part in something that appears to devalue our own community. The Pride In London’s Pride Parade takes place Saturday, July 8. What do you think of the posters? Are they as offensive as the complaints suggest, or are people making a big deal out of nothing? Sound off in the comments below. Why should GAY Pride have anything to do with bisexuals and transvestites? Assuming bisexuals really exist, that is. @MHoffman, trans people are not crazy! They may occasionally get strident, but not being heard Ir seen tends to push one to the breaking point. And JT, “Gay” pride, of necessity, includes lesbians, bi people, ace, and other queer folk. We are outsiders, multicolored birds-of-a-feather with slightly different plumage in the same boat. If we don’t work together, things could turn out as badly as that mixed metaphor in my last sentence. Yes they are. Anyone who thinks they are born biologically wrong or someone who thinks that by having a doctor chop off the things that make up that person’s identity is crazy. There are people who claim their gender changes day-to-day and identify as gender fluid. That is mental illness. What if I claimed my race changes each day? What if someone feels they were born the wrong species? He is a 52 year-old man but identifies as a 6 year-old transgender girl. Are you saying he’s not crazy? You would have liked their other rejected poster that said “Being Bisexual Is So Gay” – yuk, yuk, yuk. I don’t think there is anything wrong with the posters. The whole idea IS to attract more straight people so they do get all “Where’s my Straight Pride” on us. If they are happy all the better. I thought the idea was to attract the straight people so we could seduce and convert them. I think people must have a sense of humor about the whole thing. It may nit have been the smartest way to put it, but it IS FUNNY. Yes, I agree burningtyger – Gay’s have a history of appropriating those words that TRY to hurt us, QUEER being the most obvious example. But then again many right-on Queers don’t get irony and totally missed the whole meaning of Tori’s comment on the poster. Time to turn-it-around and grab ‘GAY’ back. There has been a surge of exclusions against what groups may march, who Pride should include, and more political considerations than ever. Most of these issues were non-existent 5 years ago. Pride organizers are starting to show more hubris than pride, and the result will be the death of Pride Parades. Political correctness will harm all we’ve strived for. Yeah…this was not well thought through. Borderline homophobic but completely insulting and once again, focussing on making “allies” feel like pride is for them and not us.